Archaeal membranes have replaced the fatty acids of bacterial membranes with isoprene; some archaeal membranes are monolayer rather than bilayer. Prokaryotes can be further classified based on the composition of the cell wall in terms of the amount of peptidoglycan present. Prokaryotes are unicellular organisms that lack organelles or other internal membrane-bound structures. Therefore, they do not have a nucleus, but, instead, generally have a single chromosome: a piece of circular, double-stranded DNA located in an area of the cell called the nucleoid. Most prokaryotes have a cell wall outside the plasma membrane. Prokaryotic cell structure: The features of a typical prokaryotic cell are shown. The composition of the cell wall differs significantly between the domains Bacteria and Archaea, the two domains of life into which prokaryotes are divided. The composition of their cell walls also differs from the eukaryotic cell walls found in plants (cellulose) or fungi and insects (chitin). The cell wall functions as a protective layer and is responsible for the organism’s shape. 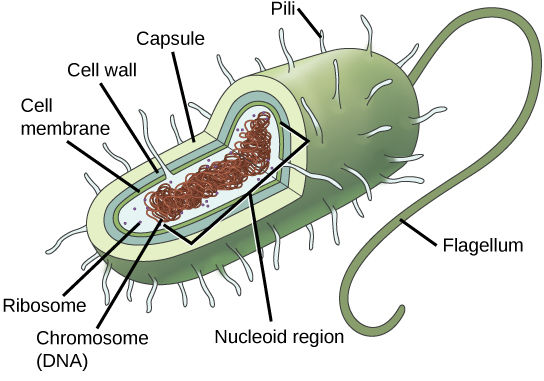 Some bacteria have a capsule outside the cell wall. Other structures are present in some prokaryotic species, but not in others. For example, the capsule found in some species enables the organism to attach to surfaces, protects it from dehydration and attack by phagocytic cells, and increases its resistance to our immune responses. Some species also have flagella used for locomotion and pili used for attachment to surfaces. Plasmids, which consist of extra-chromosomal DNA, are also present in many species of bacteria and archaea. Domains of life: Bacteria and Archaea are both prokaryotes, but differ enough to be placed in separate domains. 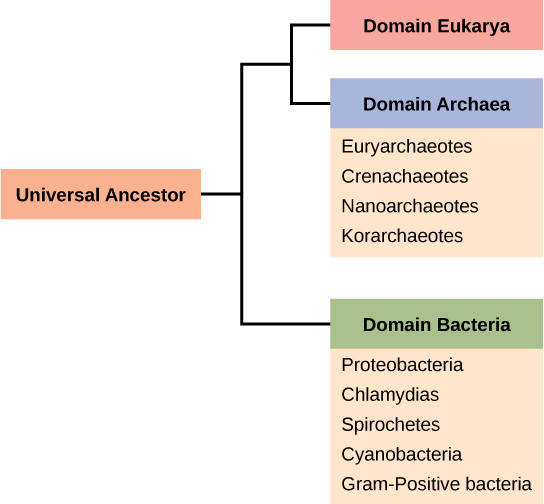 An ancestor of modern Archaea is believed to have given rise to Eukarya, the third domain of life. Archaeal and bacterial phyla are shown; the evolutionary relationship between these phyla is still open to debate. The plasma membrane is a thin lipid bilayer (6 to 8 nanometers) that completely surrounds the cell and separates the inside from the outside. Its selectively-permeable nature keeps ions, proteins, and other molecules within the cell, preventing them from diffusing into the extracellular environment, while other molecules may move through the membrane. The general structure of a cell membrane is a phospholipid bilayer composed of two layers of lipid molecules. In archaeal cell membranes, isoprene (phytanyl) chains linked to glycerol replace the fatty acids linked to glycerol in bacterial membranes. Some archaeal membranes are lipid monolayers instead of bilayers. 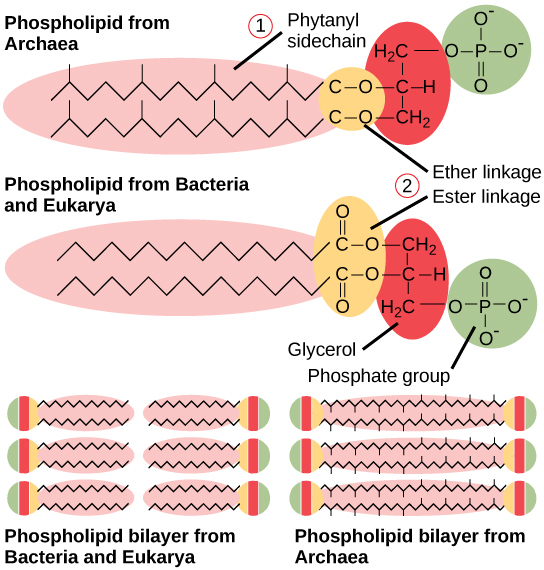 Plasma membrane structure: Archaeal phospholipids differ from those found in Bacteria and Eukarya in two ways. First, they have branched phytanyl sidechains instead of linear ones. Second, an ether bond instead of an ester bond connects the lipid to the glycerol. The cytoplasm of prokaryotic cells has a high concentration of dissolved solutes. Therefore, the osmotic pressure within the cell is relatively high. The cell wall is a protective layer that surrounds some cells and gives them shape and rigidity. It is located outside the cell membrane and prevents osmotic lysis (bursting due to increasing volume). The chemical composition of the cell walls varies between archaea and bacteria. It also varies between bacterial species. Bacterial cell walls contain peptidoglycan composed of polysaccharide chains that are cross-linked by unusual peptides containing both L- and D-amino acids, including D-glutamic acid and D-alanine. Proteins normally have only L-amino acids; as a consequence, many of our antibiotics work by mimicking D-amino acids and, therefore, have specific effects on bacterial cell wall development. There are more than 100 different forms of peptidoglycan. S-layer (surface layer) proteins are also present on the outside of cell walls of both archaea and bacteria. Bacteria are divided into two major groups: gram-positive and gram-negative, based on their reaction to gram staining. Note that all gram-positive bacteria belong to one phylum; bacteria in the other phyla (Proteobacteria, Chlamydias, Spirochetes, Cyanobacteria, and others) are gram-negative. The gram-staining method is named after its inventor, Danish scientist Hans Christian Gram (1853–1938). The different bacterial responses to the staining procedure are ultimately due to cell wall structure. Gram-positive organisms typically lack the outer membrane found in gram-negative organisms. Up to 90 percent of the cell wall in gram-positive bacteria is composed of peptidoglycan, with most of the rest composed of acidic substances called teichoic acids. Teichoic acids may be covalently linked to lipids in the plasma membrane to form lipoteichoic acids. Lipoteichoic acids anchor the cell wall to the cell membrane. Gram-negative bacteria have a relatively thin cell wall composed of a few layers of peptidoglycan (only 10 percent of the total cell wall), surrounded by an outer envelope containing lipopolysaccharides (LPS) and lipoproteins. This outer envelope is sometimes referred to as a second lipid bilayer. The chemistry of this outer envelope is very different, however, from that of the typical lipid bilayer that forms plasma membranes. Gram-positive and gram-negative bacteria: Bacteria are divided into two major groups: gram-positive and gram-negative. Both groups have a cell wall composed of peptidoglycan: in gram-positive bacteria, the wall is thick, whereas in gram-negative bacteria, the wall is thin. In gram-negative bacteria, the cell wall is surrounded by an outer membrane that contains lipopolysaccharides and lipoproteins. Porins, proteins in this cell membrane, allow substances to pass through the outer membrane of gram-negative bacteria. In gram-positive bacteria, lipoteichoic acid anchors the cell wall to the cell membrane. Prokaryotes reproduce asexually by binary fission; they can also exchange genetic material by transformation, transduction, and conjugation. Binary fission is a type of reproduction in which the chromosome is replicated and the resultant prokaryote is an exact copy of the parental prokaryate, thus leaving no opportunity for genetic diversity. Transformation is a type of prokaryotic reproduction in which a prokaryote can take up DNA found within the environment that has originated from other prokaryotes. Transduction is a type of prokaryotic reproduction in which a prokaryote is infected by a virus which injects short pieces of chromosomal DNA from one bacterium to another. Conjugation is a type of prokaryotic reproduction in which DNA is transferred between prokaryotes by means of a pilus. Reproduction in prokaryotes is asexual and usually takes place by binary fission. 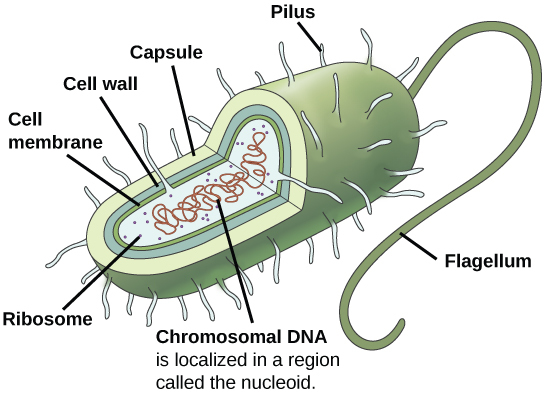 The DNA of a prokaryote exists as as a single, circular chromosome. Prokaryotes do not undergo mitosis; rather the chromosome is replicated and the two resulting copies separate from one another, due to the growth of the cell. The prokaryote, now enlarged, is pinched inward at its equator and the two resulting cells, which are clones, separate. Binary fission does not provide an opportunity for genetic recombination or genetic diversity, but prokaryotes can share genes by three other mechanisms. Modes of prokaryote reproduction: Besides binary fission, there are three other mechanisms by which prokaryotes can exchange DNA. In (a) transformation, the cell takes up prokaryotic DNA directly from the environment. The DNA may remain separate as plasmid DNA or be incorporated into the host genome. In (b) transduction, a bacteriophage injects DNA into the cell that contains a small fragment of DNA from a different prokaryote. In (c) conjugation, DNA is transferred from one cell to another via a mating bridge that connects the two cells after the pilus draws the two bacteria close enough to form the bridge. In transformation, the prokaryote takes in DNA found in its environment that is shed by other prokaryotes. If a nonpathogenic bacterium takes up DNA for a toxin gene from a pathogen and incorporates the new DNA into its own chromosome, it, too, may become pathogenic. In transduction, bacteriophages, the viruses that infect bacteria, sometimes also move short pieces of chromosomal DNA from one bacterium to another. Transduction results in a recombinant organism. Archaea are not affected by bacteriophages, but instead have their own viruses that translocate genetic material from one individual to another. In conjugation, DNA is transferred from one prokaryote to another by means of a pilus, which brings the organisms into contact with one another. The DNA transferred can be in the form of a plasmid or as a hybrid, containing both plasmid and chromosomal DNA. Reproduction can be very rapid: a few minutes for some species. This short generation time, coupled with mechanisms of genetic recombination and high rates of mutation, result in the rapid evolution of prokaryotes, allowing them to respond to environmental changes (such as the introduction of an antibiotic) very rapidly.